Good Day to all my lovely readers! Have you ever heard a phrase that said "time flies when you're having fun"? Yup, it is absolutely correct! Soon (in a few more weeks), Easter is coming. Aw, it flies too fast. Do you know what the best part is? I haven't make even one Easter card. Haitz... Lazy me (as always)!!! Hello flower, I love love this card !!! Super cute !!! Did you use cutting die ? or YOU cut it out with your hands for this rabbit ??? These rabbits are sooooooo adorable and very nice design !!! How did you cut it out ??? And very nice balance for design, love the back ground and mini roses also !!! Feels the Spring came !!! (^o^)/"""
Hey Tan - now I do not know if I am posting twice or not but I think I hit the wrong button. Your card is so original and artsy fartsy - I love it! I love seeing different styles. I have not made a single Easter card - oh woe is me. Tan, that is so fab honey! The colours are so fresh and fun too! This is cool! What a fun Easter Card!!! This looks so cool! Great Easter card! What a lovely Easter card.>Lovely rabbits. Very unique and I LOVE it!! I come to wish you a very nice and sunny day. The lacey thing I made, is just a kind of decoration. Hi Tan ..Happy Easter to you too . 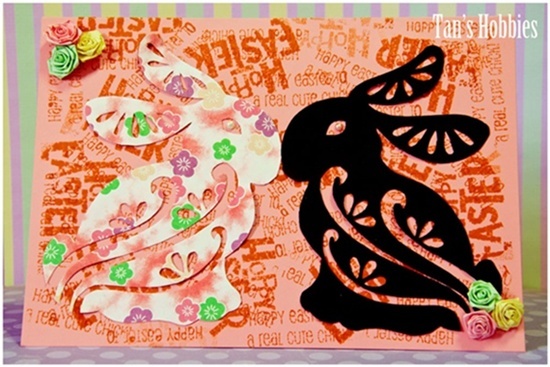 Your creation is quite colourful and I love the rabbits and your own background paper design . Hello Tan! Thought I'd pop by as you've left me such sweet comments recently! Hope to see a make from you soon!